I didn’t use to like tempeh. Now, I do, thanks to easy, fool-proof recipes like this. Look at that saucy caramelization! Oof. Any of you tempeh haters out there, prepare to be converted. This recipe requires just 7 ingredients to make and involves the easiest preparation ever: Steam tempeh, make marinade, let marinate, BAKE. That’s it! The only part that takes a little planning is the marinating. I suggest a 2-24-hour window. The longer the better and the more saucy and flavorful your tempeh will be. So go on. Give it a day. Go out and see something, kid. Go explore the city. Go see nature. Let your tempeh do its thang. Then bake until golden and caramelized and brush with remaining marinade. So easy. So saucy. So essential. Put this tempeh on EVERYTHING. Think noodle dishes, salads, in spring rolls, and more! Not to worry, I have a blissed-out salad coming your way in a few days that’s perfect with this saucy tempeh. Stay tuned! If you try this recipe, let us know! Leave a comment, rate it, and don’t forget to tag a photo #minimalistbaker on Instagram. We’d love to see what you come up with. Cheers, friends! 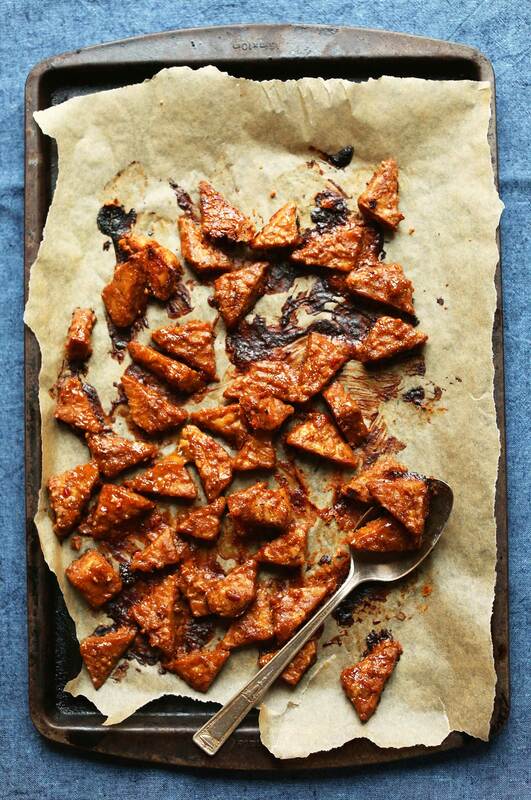 Saucy, baked tempeh marinated in a spicy-sweet peanut sauce! Super flavorful, hearty, and perfect for topping noodles, salads, & more! Vegan + gluten free. To remove bitterness from the tempeh, add to rimmed skillet or saucepan filled with 1 inch of water and bring to a low boil over medium heat. Steam tempeh for a total of 10-12 minutes, flipping once at the halfway point. Then rinse, pat dry, and cut into thin, bite-size pieces. I prefer slicing the tempeh in half lengthwise then cutting into small triangles. (The smaller the pieces, the better they can soak up the marinade.) Set aside. 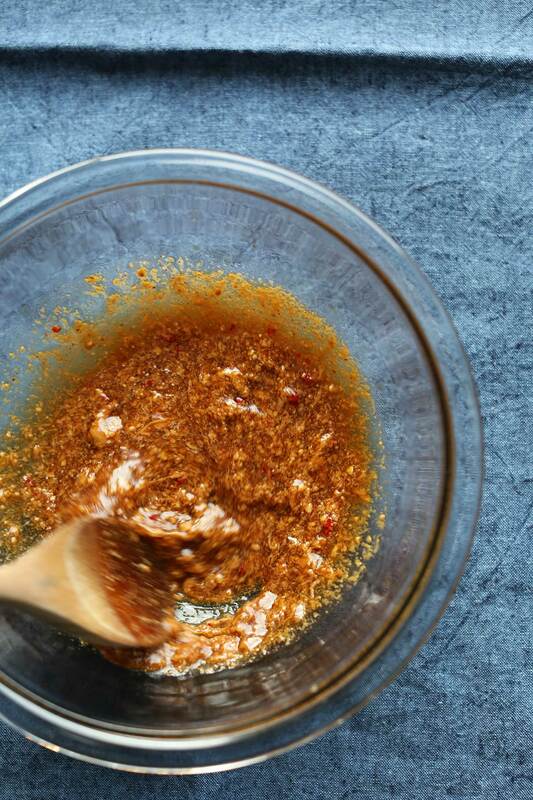 Mix marinade by adding chili, sesame oil, peanut butter, tamari, lime juice, and maple syrup. Whisk to combine. Taste and adjust flavor as needed, adding more crushed chili for heat, maple syrup for sweetness, lime juice for acidity, or tamari for saltiness. Don't be shy - you want this extremely flavorful! Once marinated, preheat oven to 375 degrees F (190 C) and line a baking sheet with parchment paper. Add tempeh and reserve any leftover marinade to brush/coat the tempeh once baked. Bake for 22-30 minutes or until caramelized and deep golden brown. Remove from oven and brush/coat with any remaining marinade. This tempeh is delicious for adding to Asian-inspired dishes like spring rolls, salads, and noodle dishes! Store leftovers covered in the refrigerator up to 3 days. Best when fresh. *For more tempeh recipes, check out my Easy Vegan Meatballs and my Smoky Tempeh Burrito Bowls! *Recipe makes ~1 1/2 total cups. First time trying tempeh, a couple of thoughts. Not sure it really benefits from so long soaking, I think most of the soaking happens in the first hour or two. The lime juice adds a bitterness that to mine and my partners palate doesn’t need to be there, it needs more peanut and I would also add tahini for even more nutty flavour, id also add honey not maple and slightly more of it. Overall a good starting block so will try again with these tweaks and see what happens! Sooooo good, even my brother and sister who are very skeptical to this sort of thing loved it! Thanks for the recipe!! This was absolutely delicious! I marinated overnight, put in the oven for dinner this evening over a bed of noodles and veggies we loved it! Thank you so verymuch for this delightful addition, it’s a keeper for sure!! Even my non-vegetarian loved this. Said tempeh still had texture of styrofoam but flavor was great. Wants me to put it on chicken! Lol! To be honest I had never tried tempeh before making this recipe, so I wasn’t really sure what to expect in terms of flavor. However, I feel like I followed the recipe closely. I marinated in the fridge for almost 20 hours and noticed that the tempeh had soaked up all the marinade (which had become goey and thick). Also, it seemed like some pieces crumbled a bit. I didn’t use the extra drizzle of maple syrup or tamari and proceeded to bake. Afterwards the tempeh was chewy (I think I was hoping for more crunchy, like crispy tofu). I did not enjoy the flavor. It seemed a bit overwhelming. Are you able to advise what might have went wrong? Thanks. Hi Evelyn, sorry to hear you weren’t a fan! One idea could be the brand of tempeh- we prefer the Tofurky or LightLife brands. For some, tempeh is an acquired taste. I had never tried tempeh before. Followed the recipe exactly. I’m not a fan. Nor was my husband. Compost got a good meal. The texture was the real turn off but the flavours in the marinade and sauce were underwhelming. This is definitely in my top 3 as far as recipes go. I’ve probably made this about a dozen times now, usually in stir-frys by doubling the sauce recipe. My boyfriend (super meateater) is always sooo excited when he sees the tempeh marinating in the fridge. Tonight I just made it again with some roasted roasted veggies and quinoa topped with tzatziki. Oh. My. Goodness. Everyone needs to try this. I love Tempeh naturally, but this recipe is dynamite! Combined with my Thai Red Curry with veggies and brown rice, and I was dancing during my lunch break! Been on the lookout for both a good tempeh marinade and a good peanut sauce and found both in one recipe! 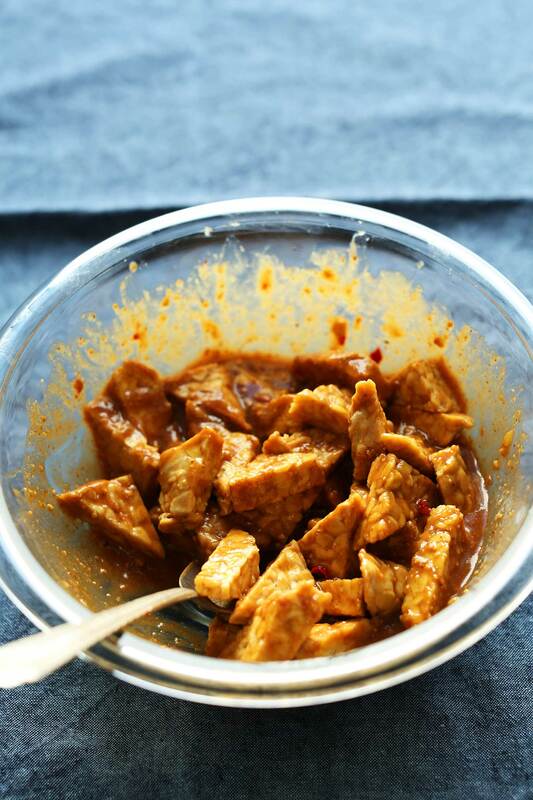 The peanut sauce works really well with the nutty flavor and texture of the tempeh. Served mine over udon noodles with extra marinade serving as sauce for the noodles. Will definitely make this again. I LOVE this recipe. Leftovers freeze well (separated on a cookie sheet, then tossed into ziplock). I DOUBLED the recipe and added 1 tablespoon grated ginger and a bit of garlic. My husband is on low salt diet, so I used low sodium tamari and no sodium added peanut butter. I try to make the marinade first so the hot tempeh soaks marinade up better. Thank you for this!!! I’m not a vegan, but I do eat vegetarian most of the time (mainly because I dislike handling raw meat, lol). I was already a tempeh lover, but this was the first recipe I’ve used to marinate and bake it. Subbed soy sauce, red pepper flakes, and honey, with great success. After 26 hours, the marinade was very thick and goopy. Sadly, I did burn them a little, but I can’t wait to try another batch soon! I think I’d add more peanut butter next time for additional peanut flavor. Loved the recipe. Thank you!! OMG, Thank you so much for this recipe. I really like tempeh and am always looking for new ways to make it. I ended up marinading this for 2 days. I couldn’t believe how fantastic it is. I eat it hot or cold. Nobody’s getting this but me. If you don’t have an oven, would cooking/sauteeing the tempeh in a skillet/stovetop work ok? I just made this tonight after letting it marinate for 24 hours. I skipped the oil and forgot to add extra of the other liquids so the marinade ended up a bit thick after it was in the fridge for the day. However it tasted bomb and I used the same marinade to bake some chickpeas. Legitimately one of the best meals I’ve EVER made! Tempeh was so good and it was perfect with sautéed kale, quinoa and the chickpeas. I’ve kind been burnt out of cooking recently so this success was much needed! I made this recipe exactly as written. I cut it in half along the flat side (if that makes sense) then into small triangles. IT IS SO SO GOOD! Wish I had made a double recipe!! 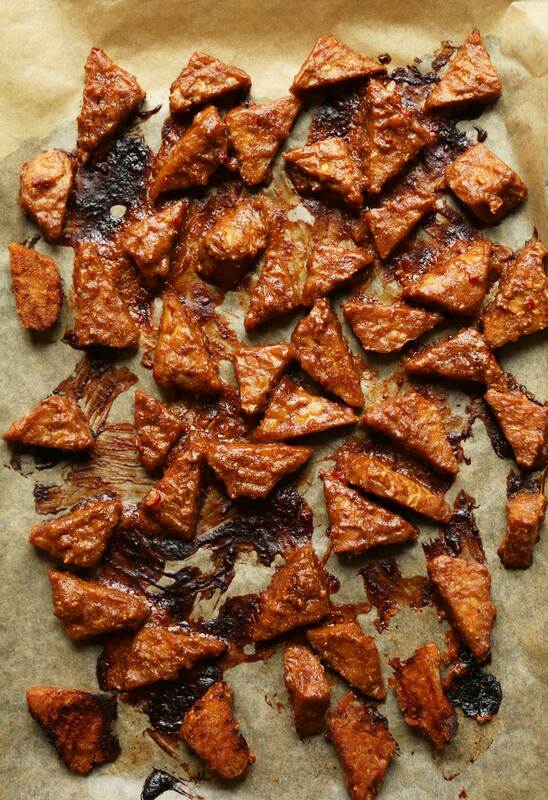 I’m a big tempeh lover already so can’t wait to try this recipe with all the rave reviews! 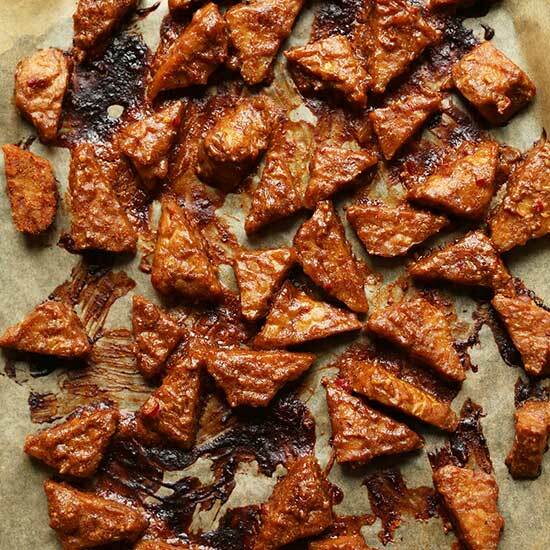 I love the flavor and texture of tempeh (I don’t find it bitter, more nutty tasting and I usually pan fry it) and am curious if the steaming and marinating change the texture? Does this method make the tempeh softer? Thanks! This peanut tempeh recipe is blowing my mind. So good! I made it 1st with your thai salad (amazing) and currently have another batch in the oven now just to snack on 😁 Thanks Dana! We are glad you enjoyed this recipe, Diana! Delicious! I could’ve eaten it without baking it, too, because it tasted so yummy. I don’t usually buy nor eat tempeh, but after making this I might eat it more often! These are absolutely delicious, but should you truly –steam– the tempeh or does it go straight into the water? I did the latter, which made the tempeh a bit more crumbly than maybe it should have been? The end result was still awesome, but would come apart if I used it in a stir fry. No matter: I’m eating it like cookies at this point! Hi James! We recommend you steam the tempeh for a total of 10-12 minutes, flipping once at the halfway point. Then rinse, pat dry, and cut into thin, bite-size pieces. Made this tonight. Marinated about 4-5 hours because I always forget to marinate things overnight. But it was delicious! Thanks for sharing the recipe. I’ll definitely be making again. Since I was short on time and didn’t want to heat the house up with the oven, I added the tempeh, all sauce ingredients except for the lime juice, and water to cover in a medium saucepan. I used a high flame to bring to a boil then simmered until the liquid was reduced by half, turned off the heat and added the lime juice. The warm sauce was the dressing and the spinach leaves held up really well to the warmth of the tempeh and sauce. The only addition I made was some fried shallots on top, the ones in the big plastic jars from the Asian food Mart. The herbs are so refreshing, you have sweet/heat, crunch, soft cold noodles, and juicy tempeh. This was fantastic for a post-workout dinner! Wow, this is such a good idea. Thank you for sharing! I wouldn’t have thought to boil it in the sauce. Hi! this looks delicious! Could I use almond butter instead of peanut butter you think? You’ve done it again! Your words, ‘ if you’re not a tempeh lover…’ resonated with me, but this is just great. I cut the pieces a bit (too) small and after 20+ hours, some were mushy and unable to hang onto the skewer. But decided to toss those in a hot pan and give this a test-run! Delish! Thank you for making aNOTHER quick-easy-foolproof VEGAN recipe! We are so glad to hear that you enjoyed this recipe, Lori! Wow. I went to a friend’s house for dinner, and she served this in butter lettuce cups with diced water chestnuts and green onions. My husband, who usually turns his nose up at vegan fare, begged me to get the recipe and make it at home. It was THAT good. I love this recipe!! So yummy and easy. I make it all the time. Hey there! Would it be possible for me to store it in the freezer and heat it up when I need it? If so how long can I keep it for in the freezer? I used tofu instead of tempeh and it was divine. Thank you for the recipe. I forgot to steam the tempeh! I made this for my daughter who is a recent vegan. I tried it too and unfortunately it did not taste good. It tasted like cardboard peanut butter to both of us. I recommend adding some more spice to it; perhaps even a titch of Himalayan sea salt or something else to give it flavor. I really did enjoy the tip about boiling the tempeh before marinating it. Thank you for the recipe and I am sorry we did not have success with it. I was going to make this for dinner tonight, but our plans changed. By now it has been in the marinade for 24 hours, how long can you have it marinading? I probably wouldn’t marinate it for any longer than 24 hours! I ended up marinating it for 48 hours.. Thanks for getting back to us, Katja! Great recipe! The marinade was fantastic! Didn’t have any limes, so I added apple vinegar, ginger syrup instead of maple and lemon rapeseed oil. Also the peanut butter I used contained coconut and it all came together perfectly! We ate it with veggies in tortilla wraps and on avocado toast. I’m new to tempeh and now it’s going to be one of my favourites! Thank you! Loved it! Best way to roast tempeh. This peanut sauce is a nice change from barbecue sauce. Your recipe gives it an Afro-Asian vibe, which I crave. To adjust the marinade, I used hot pepper sesame oil, plus pepper flakes, fresh thyme, soy sauce, peanut butter, maple syrup. I used orange instead of lime, since I did not have the lime. I simply sliced tempeh into inch-size strips straight from the package. I did not steam it first. I put in container, poured marinade on tempeh, and gave it a vigorous shake. Refrigerated it overnight. Roasted in oven. Delicious! Thank you! I made the marinated tempeh. It was good, but not great. I followed the marinade recipe and directions exactly. Would probably not make this again. The marinade was quite thick after about 20 hours so I added an additional mixture of maple syrup and soy sauce (as suggested as a basting cooking tip), which definitely helped. It made the mixture moist again and most likely added more flavor. It wasn’t overly flavored. My family liked it, but no one loved it. I will probably go the BBQ route next time I marinate tempeh. The leftovers the next day were even better than the freshly baked tempeh! Amazing! I wasn’t a tempeh-hater, but I wasn’t really a tempeh lover either. I had some in my fridge and was thinking about what to eat for dinner, so I thought I’d give this a shot. It was AMAZING. I served it as a bowl with brown rice, steamed broccoli and green beans, and made some more peanut sauce to put on top. This is for sure my new favorite way to make tempeh and I’m pretty sure will be a weekly meal for us. Would love to see more recipes like this with different sauces! I followed the recipe exactly and served it with quinoa and sautéed bok choy. This was an excellent way to serve tempeh and I will definitely use this recipe again but maybe tweak the marinade. While it boasted strong flavors to tantalize the taste buds, I feel like it needed some fish sauce and/or ginger. All in all, great recipe and I will continue using it as a base then add modifications. I had been eyeing this recipe for forever and finally made it this weekend to have with the Rainbow Thai Salad (also from Minimalist Baker) – LOVED it! My last experience with tempeh was less than stellar, and I’m SO glad I didn’t give up on it and gave it a shot with this recipe. I used almond butter and subbed paprika for the chilli because I’m not super into spice. I also marinated for just under 24 hours, which was perfect. I am 100% going to make this again! I went vegan for about 4 months and this was one of the recipes I tried during that time. I fell in love and made it weekly!! Now that I went back to not being vegan, I still make this recipe all the time because it is just so delicious!! I do everything as listed in the recipe and it’s perfect every time. Thanks for sharing!! FANTASTIC!!! Perfect flavor balance and so easy. I marinaded for 24 hours; the tempeh was packed with savory flavor. This is now part of my go-to recipe collection. Thanks! Looking forward to trying the peanut recipie. Do you always steam your Tempe before using? I made this last night and it was SO good. My friends loved it as well. I made it with udon noodles and roasted cauliflower. I doubled the sauce recipe to drizzle over top of each bowl. It served three of us nicely. Thanks for this simple and delicious recipe! I made this recipe for the second time tonight and I doubled it this time!!!! A few delicious meals are waiting for me! Thank you so much for this delicious recipe!!!? I made this recipe and it is awesome for my first time ever preparing Tempeh. I am curious though if 1 serving (1/4 of a serving of the recipe) would that equate to about 2 oz.? I am a tracking my food intake to diet. I made this for dinner last night; DELICIOUS!! I steamed, cut and marinated for 24 hrs with the exact recipe. I baked it with all the extra marinade and a bag of broccoli stir fry mix. We were fighting over the last bit and licking the bowls! I am printing this recipe and handing it out to all my co-workers ! Well done!! I made this tonight with broccoli and water chestnuts and it was SO good. My teens said 10/10. Thanks! Tried this a few weeks ago and loved it. But also thought with a few modifications it would make a great mole style marinade. So I tried it tonight with Mexican street corn and shredded cabbage. I used the same peanut butter and soy (brags) base, but put in a diced chipotle in adobo with 3 T of the sauce, about a 2t each of cumin, coriander, and garlic powder, 1T of chile powder, salt, pepper and , a while Lime, and 1 square of dark 85% cocoa shaved into the sauce. Left it overnight and prepared as directed with a few sports of brags over it. I’ve been looking for a different way to translate vegan to Mexican and really happy with this adaptation! I’ve used this recipe a few times, it really transforms tempeh into something delicious. I use gochujang in place of birds eye chili, seems to work great! Tried it over a Thai noodle bowl the other day. I never knew I liked peanut sauces so much! These were very tasty overall! They seemed a bit more dry than I was anticipating, but this could be because I only marinated them for about two hours (rather than the 24 hours suggested). Great flavor though, and went very well with the Thai salad recipe also found on this blog. I’d like to know if I can use tvp chunks instead of tempeh, as it’s really expensive in my country. In this tempeh recipe you say boil and steam in the same situation. Which do you mean or does it really matter? Steaming, marinating for 24h and baking…ad to tell myself to stop eating it? HI I can’t eat a lot of maple syrup straight up sugar cause I have PCOS. I’m wondering if there is anything I could do in the dried fruit or raw fruit realm to add sweetness in place of maple syrup which will for sure spike my insulin a lot? or if I only use one tablespoon will it still taste good? I like a lot of heat but it sounds like most people are using a ton of sweet. I have just tried your tempeh recipe and it was surprisingly delicious! Didn’t think I would buy tempeh beyond my detox but now I will. Other recipes I have tried during my detox were great too. Will definitely recommend your site thanks. Loved the flavor of this recipe so much! Any tips on how to not have the tempeh crumble when you cut it? Very carefully! No other tips really. On this one, I’d suggest using a serated knife or a tomato knife to cut things that crumble. Also, saw back and forth to cut. My oven is broken. If I cook the tempeh in a skillet is there anything I should change? Also, can I use olive oil? Looking forward to trying it! I would cook it on a high temp first, then a low temp to cook through. Hope that helps! My husband wanted to try this, but tempeh has always freaked me out lol! It’s marinating in the fridge right now. I hope it turns out like yours because the photos look delicious. So far the marinade was amazing!!!! Putting this on the Thai salad recipe you posted. We had to go to Natural Grocers and buy the big’n of tamari sauce! I’m loving your Asian-inspired dishes, Dana! Thank you so much. I have made this twice this week! I marinated the tempeh for 48 hours the first time, and 6 hours tonight. Yummy both times! Next time (next week, probably ;)) I plan to soak for the full 24 hours for good measure. I used pad thai rice noodles first time and thinner rice noodles the second time (tonight). I prefer the pad thai rice noodles because the thinner noodles require more dressing for flavor. I used peanut butter for the marinade and almond butter for the dressing. I also added a little more pepper flakes to the marinade than you suggested. Fresh mint and cilantro are KEY. So, so good! & thanks for the <3 on my instagram story! Thanks for this review. I was planning to make this tonight, but dinner plans changed, so I’m thinking it’ll have to marinate for 48 hours. I’m glad you had success letting it sit that long. I’ve never steamed tempeh before marinating..but I have also never had good results. I’m so excited about this tip! Hopefully I will be converted into a tempeh fan too! This recipe cured my distaste for tempeh! I made it to top the Blissed-out Thai Salad, but could honestly have eaten this tempeh by itself (and did, right off the pan!). I will be making it again for salads and wraps. I buy Lightlife tempeh. The package doesn’t say steaming it before use is necessary. What are your thoughts on this? Should I steam it first anyway? Give it a try without! Let me know how it goes. Delicious! I messed up my tempeh cutting and ended up with ground tempeh. Still wonderful! Great flavors even though I only had 2 hours of marinating time. This recipe is now a part of my regular repertoire. Just made this recipe and we loved it! Beautiful, colorful salad and the tempeh and dressing were so good! We added a little more chili garlic sauce (and sriracha) because we like a lot of heat, but that was the only thing we changed. Will make this again. Thanks! Delicious and addictive! I can see adding this to so many things. Great recipe! First time trying tempeh and we loved it! Health conscious DH said this is a keeper. Made according to the recipe, marinating 24 hours. Used it in salad. Thanks for the recipe. I come from a family of heavy meat-eaters so when I made this for them for dinner along with your bright green spinach curry, I was a little hesitant on how they would respond to their first time trying tempeh. It was so delicious smelling coming out of the oven, they even began to pick it off the pan to eat before dinner was even done. Rave reviews all around. They even REQUESTED it the next time they came to visit. The only things I subbed was coconut oil instead of sesame oil..
Any idea what may have caused this? Or what is the best thing I can do to save it? Hi Phil! The coconut oil is your culprit in this one! Coconut oil will become solid upon cooling and is not ideal for a marinade. Next time, I recommend sticking to sesame oil and you should be good to go! Good luck! This was incredible tasting!! My new favorite thing! I never could make Tempeh in a way that I loved. I mean, it was okay, but not great. This was just delicious. I will be making it over and over. It was a hit, my husband ate it on his salad and I ate it with some noodles. It will go in so many things. I was thinking it would make a tasty sandwich too. Thank you!!! I have made this at least 5 times now. SO GOOD! I added some minced ginger and turmeric root last time. Yum! I make and eat a lot of tempeh- never have had a problem with it being bitter regardless of the brand. So good! I didn’t realize that I needed to marinate overnight, so only marinated for 2 hrs. Still delicious! Thank you so much for this recipe! After eating Tempeh for the first time in Bali a few years ago, I tried to make it at home several times but always got disappointed. This Tempeh now is by far the best I made and I def. will make this again and again! I am so glad you like tempe! I am Indonesian and grew up eating tempe! Ever since I’m in the US, it has been a struggle to look for good tasting tempe. What kind of tempe do you normally have? Your tempe looks delicious! I can’t wait to try this! Oh and if you would like to cook tempe in a different way, try frying them until crispy or make tempe bacem. Tempe bacem is sweet and slightly sour from coconut water, kecap manis, palm sugar and tamarind. I bet you’ll love it! made the marinated peanut tempeh for the Blissed out Thai Salad – this was SO good. I ate as my main dish while my husband had it as a side. I followed the recipe except I substituted sriracha sauce for the chili garlic sauce because I didn’t have any. We brainstormed and agree that if your skipping the tempeh to add some crushed peanuts. Already plan to bring to summer picnics, so refreshing. Marinated this overnight and cooked it tonight and it was delicious! Took my stir fry to the next level. Low on maple syrup so I also added a bit of brown sugar. Thanks for the recipe! I tried this recipe (and tempeh!!) for the first time tonight. It was soo delicious! I am not vegan or vegetarian (yet) but adore your recipes. Thank you for sharing! This is awesome! Steaming the tempeh before marinating it really helps the flavor infuse. Oh, I used sambal instead of chiles and it turned out great. Thanks for all the great recipes and content! Really really easy and delicious! I didn’t have a lime, used lemon juice, it was fine. I served it as a side, but this is a versatile dish; it would work well in many combinations, and could even be an appetizer! this is hands down THE BEST tempeh I have made and have ever had in my life. I will be making this all the time seriously. It is so easy and amazing. AMAZING job Dana! Wow, you weren’t lying about how good this is!! I kept buying tempeh at the store, it would sit in the refrigerator, I wouldn’t know exactly what to do with it (despite the countless vegetarian and vegan cookbooks I have), it would expire, I would toss it and be sad. NO MORE!! I’ve made this twice now. The first batch I marinated for 6 hours, it was good, but still kind of dry. I also didn’t split the tempeh in half to make it thinner in Batch #1. I could not find any dried bird’s eye chili’s, despite my searching, so used crushed red pepper flakes as recommended. I used salted creamy peanut butter for both batches. I used Bragg’s Liquid Aminos for the tamari (it is also gluten-free), and I did use the sesame oil (plain, light colored, not the darker roasted variety – was I correct here??). In the first batch, I did drizzle the maple syrup and tamari (Braggs) as suggested, but merely poured it from the jug and bottle. It was not very uniform and was pretty messy. The second batch I mixed the maple syrup and Bragg’s in a small bowl, whisked it together and then brushed it on – much better results. My mix was probably 2/3 maple syrup to 1/3 Braggs. Then the cutting of the tempeh. The first time, I cut the slab in half lengthwise and then into the triangle shapes. They were still kind of thick. The second time, cut the slab into 2 pieces (so I had 2 kind of square shapes), and then split each segment in half so I ended up with 4 much thinner segments. Then I proceeded to cut those segments into the same small triangle shapes. Because I split the tempeh into thinner sections, I ended up with twice as many triangles in batch #2. I also marinated batch #2 for 48 hours (woops – change in dinner plans that night). It still worked out, most of the marinade was absorbed when I took them out of the container to bake them, so the brushing on of the maple syrup and tamari/Braggs really made a difference. We served the tempeh bites over the Blissed-Out Thai Salad – YUM!!! My meat-eating husband requested that I keep this on a weekly rotation, which I happily will!! AWESOME Recipe Dana!! Thanks once again for helping us eat better and having it be extra delicious at the same time!! Made this last night..the hubby gave it a ten. This no-love for tempeh girl gave it a…..10! It was super! It was the first time I have ever tried the steaming method and it makes all the difference! I am converted. No I can not stop thinking of what to make with tempeh next! I absolutely loved this. The goal was to keep it for a week’s worth of salads but we ate most of it already, haha. My 1.5 year old loved it which is a huge deal to me. Thank you for this recipe. Finally, a tempeh recipe that is a keeper. This looks delicious! I’m going to put these in fresh spring rolls for lunch – is there a dipping sauce you’d recommend which would work well with the peanut marinate flavour? This is awesome! My only problem is that the tempeh pieces are so fragile that there were bits of uncooked tempeh in my marinade, so I felt I couldn’t really use the remainder of the sauce to coat the baked pieces. Did anyone else have this problem? Hi! I’m curious if you used toasted or plain sesame oil? Thanks! I used toasted with great success! Made this tonight with a bowl of jasmine rice and broccoli. I’ve never found tempeh to be particularly bitter so I didn’t steam, but I marinated it for 20 hours and it was great! Wonderful flavor and so simple. Marinated it for 24 hours but still didn’t feel like a strong flavour. Any suggestions? Just made this over the weekend and it is AWESOME! Made it exactly as stated in the recipe (let the tempeh sit in marinade for about 15 hours). I am eating it over a salad and it is just perfect. I’m a fan of tempeh but this is by far the best I’ve ever had it. Thank you for such a great new recipe ? I just bought smoky tempeh. Would that work well with the peanut? I think so! Let me know if you give it a try. I’ve never cooked with smoky tempeh. I made it with smoky tempeh and it is DELICIOUS! Serves 4? Serves 2. Hahah. I assume sesame oil means toasted sesame oil? I can never find tempeh where I shop, but I’d love to try this dish! Do you think tofu would work? I do! But it would definitely need to be extra firm tofu. And it will have a softer texture. Let me know if you give it a try! This was such a yummy recipe! I added ginger and subbed orange juice instead of lime but it worked out perfectly:) I might make some extra sauce next time for the veggies/rice but o so delicious. Definitely a keeper, thank you! I can’t wait to try this and tell you how it works for me. I will try using honey since my kid is allergic to maple syrup. I think it works just the same. Can’t wait to try this one! OMG. How would you suggest reheating it after it’s been in the fridge for a couple of days? Hi! While it is best when fresh, you can throw your leftovers in the microwave or oven and reheat until warm! Could I sub in honey or brown sugar for the maple syrup? If so, what amounts should I put in? Can’t wait to try this one out, thank you for your creativity in all your dishes!! Hi! I have not tried those subs but honey should work in place of maple syrup at the same amount! If you give it a try, let me know how it goes! Yum! This is so my kinda flavor! I could eat this everyday I bet! Hi there, this looks delicious! Can’t wait to try! I’m a little confused about the first step. Does the tempeh go straight into the boiling water or in a steamer basket above the water? Hi! Place the tempeh right in a saucepan with 1-inch of water! Bring to a low boil over medium heat for a total of 10-12 minutes, flipping once at the halfway point. Happy cooking! Which do you prefer more, tofu or tempeh? And why? I think I’ll start experimenting with tempeh! But tempeh marinates well and is great for salads and stir fries! Also, tempeh is fermented which makes it a bit healthier for you in my opinion. Tempeh is fermented which makes it far healthier than tofu. Also, tofu is usually made from GMO soybeans and not healthy in two counts: too much unneeded estrogen from soy, and Frankenfood from GMOs. If you end up trying it on roasted cauliflower or something, I’d love to know how it turned out! Would aminos work in place of soy/tamari? Hi! I have not tried it in place of soy/tamari but I think it should work just fine! Let me know how it goes if you try it! I exclusively use Braggs aminos instead of soy sauce/tamari for this and all of the Minimalist Baker recipes–go for it! I’m in the same boat with my dislike for tempeh! Everyone keeps telling me how wonderful it is, but every time I have it, blegh! I’ve been a vegan for five years now, I thought it would have grown on me by now, as most things do, but nope. Curious to see if you were converted! Have you tried the tempeh hoagie from mellow mushroom? It inspired my tempeh addiction! Really delicious just the way you wrote it! Thank you! So excited to make this. I heart tempeh! Is there any substitute for the peanuts? I have a peanut/hazel nut allergy but all other nuts are fine. thanks, and can’t wait to try the recipe! I would steam or poach it , not only takes away bitterness it Also helps the tempeh absorb the flavor a better . Thanks for this tip, Fran! I was wondering why my copycat mellow mushroom tempeh hoagies were not good! I have to avoid fat due to a compromised pancreas. I’ll sadly leave out the sesame oil (thanks for the tip of extra soy, lime, and maple) but peanut butter also is synonymous with fat, so I use powdered peanut butter. Think about it – what to do with all the remains after pressing out the lovely oil for frying?? It’s pure concentrated peanut. Mix it with a bit of water for a sandwich or, here, just add the powder so as not to dilute flavor or mess up consistency. I’ve tried about six different brands and my favorite is PB2. Peanut butter is 12 grams/fat per 2 TBS serving. PB2 is 1.5 grams. I’ve been using PB2 as a substitute for my peanut butter as well. I used it with Dana’s PB Overnight Oats and it was DELICIOUS! Dana, your recipes bring pure joy… simple, delicious, plant based meals that are also healthy. Seriously in love with your blog! Please, more recipes and more cook books! Yum yum from snowed in Switzerland! Is bird’s eye chili a brand of chili powder or a type of chili? This looks so good and I’ve been wanting to experiment with tempeh, thanks for this recipe! I’ve know it to be small red chilies, usually associated with Thai cooking! But really any hot pepper will do! That first photo is making me so hungry. The recipe that turned me into a tempeh lover was fried temeph, dusted in chinese 5 spice, and served with a spicy peanut sauce. This is just bringing me back to that first experience. I’m excited to try the peanut sauce with that squeeze of lime.